Image Size: 24.5 X 30 in. And the word went out: Michael Stringworth, on that very same afternoon, would be performing his first self-produced, self-directed, self--choregraphed puppet extravaganza. 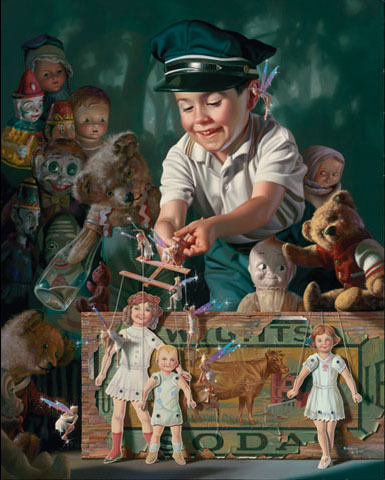 All of the toys and all of the dolls and all of the bears were ceremoniously shuttled into the clearing in Mr. Gregor's woods. There they experienced what critics would latter proclaim as: "The very essence of stringed perfection", "a jubilee of hanging, hopping, happiness"; "a veritable plethora of marionette magic", "two thumbs up!" Every one went home that day, smiling and whistling the new puppet show tunes, Michael modestly replied that he had "done his best".